Drizzle the olive oil over the chicken and season with herbes de Provence, salt and pepper; set aside. Heat a grill or grill pan over medium-high heat. While the grill heats and right after you drop the orzo in the water, heat the 2 tablespoons of oil in a heavy large skillet over medium heat. Add the shallot and garlic, and saute until tender and fragrant, about 1 1/2 minutes. Add the broth and tomatoes and scrape any bits off the bottom of the pan. Simmer the tomatoes for 2 minutes, then add the broccoli. Cook until broccoli is tender, about 8-10 minutes, stirring occasionally. Start grilling the chicken while the broccoli cooks, turning after 4-5 minutes and grilling for another 3-4 minutes. Remove the chicken from the grill and allow to rest for 5 minutes, then cut into slices. Stir the yogurt and cream into the tomato and broccoli mixture. Add the drained orzo and toss to coat. Remove the skillet from the heat. Add the Parmesan and toss until the sauce coats the pasta thickly. 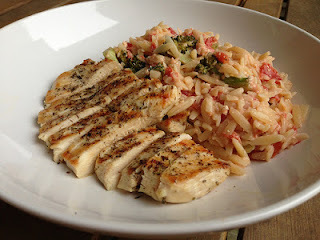 Season the orzo with salt and pepper to taste. Sprinkle on extra Parmesan, if desired. Serve with the grilled chicken. Break cauliflower down into florets, and then steam to cook. I did this by placing the cauliflower into a large, microwave safe bowl, added about 1 inch of water, and covered with plastic wrap. I microwaved on high for about 4-6 minutes, or until the cauliflower was tender to my liking. Drain any remaining water. Spray a small, nonstick skillet, with non-fat cooking spray or an olive oil mister and set over medium high heat. Add in black beans, tomatoes, garlic and cumin. Sauté until heated through…about 2 minutes. Divide cooked cauliflower amongst 4 serving bowls, and season with salt and pepper. Top each serving with ¼ cup cheese, and microwave for about 1 minute, or until the cheese is melted. 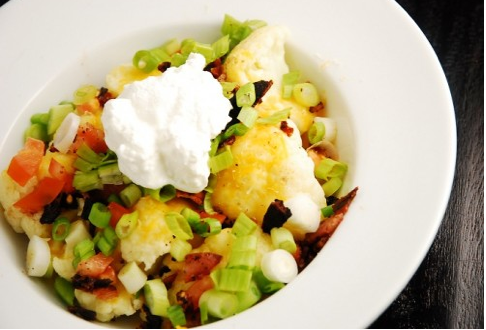 Now top each serving with ¼ of the tomatoes/black beans, 2 tbsp fat free sour cream, and ¼ of the chopped bacon and scallions. Serve immediately. Drop dough by tablespoons, 1 inch apart, onto two baking sheets. Top each with a chocolate square. Bake just until lightly golden, 11 to 13 minutes, rotating sheets halfway through. Remove sheets from oven; heat broiler. 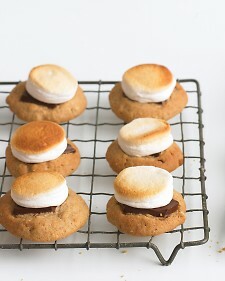 Top each cookie with a marshmallow. One sheet at a time, broil until marshmallows are lightly browned, 1 to 1 1/2 minutes. Transfer cookies to wire racks to cool.